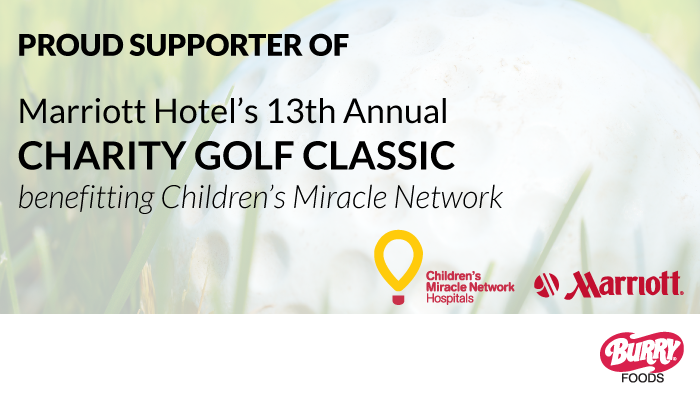 In support of Children’s Miracle Network, Burry is donating buns to golfers at Marriott Hotel’s 13th Annual Charity Golf Classic benefiting Children’s Miracle Network. To learn more about how you can support this worthy cause visit childrensmiraclenetworkhospitals.org or donate today! To provide the best care for kids, children’s hospitals rely on donations and community support, as Medicaid and insurance programs do not fully cover the cost of care. Since 1983, Children’s Miracle Network Hospitals has helped fill those funding gaps by raising more than $5 billion, most of it $1 at a time through Miracle Balloon icon campaigns. Its various fundraising partners and programs support the nonprofit’s mission to save and improve the lives of as many children as possible.